The classic Dungeons & Dragons Lawful/Chaotic, Good/Evil Character Alignment matrix. The great debate. There are a large number of tropers who feel that every character in fiction (and many people in Real Life) should be assigned a place in this grand moral/ethical classification system, and that this place can be determined with a great degree of accuracy from their observed actions and their stated beliefs. However, we have a firm rule on This Very Wiki about not adding alignments to characters who do not have them in canon. Why is that? Well, let's start with an example that most tropers ought to be familiar with: Batman. The Caped Crusader, champion of vigilante justice. What alignment is he, exactly? He is brutally intolerant of villainy, in whatever form it may appear. There's no moderation; you're either on the side of Good or of Evil, and may the powers that be help you if Batman judges you evil. Good people aren't much better off, because if you aren't helping him, you're at best an obstacle and at worst an enemy as well. This is the behavior pattern of the Lawful Neutral Knight Templar. It goes on. 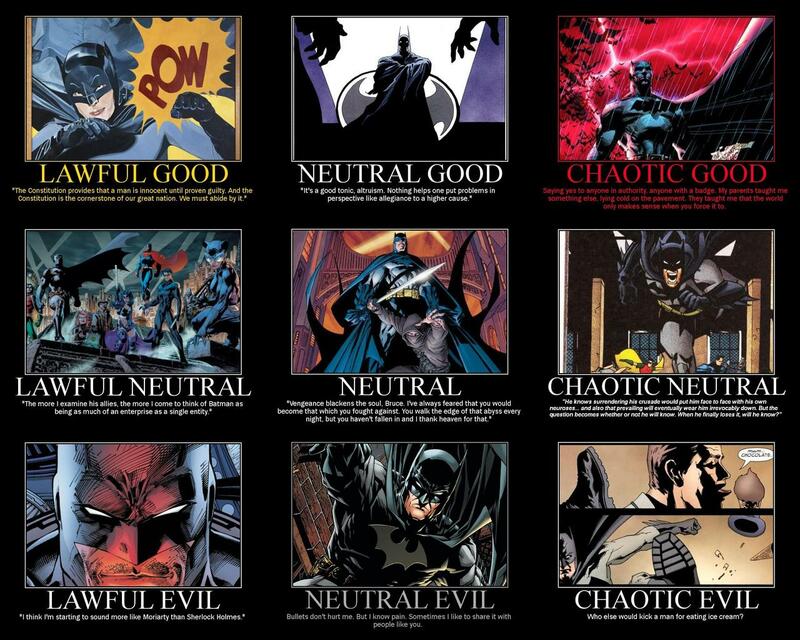 There's a reason someone created an alignment chart with Batman in each position ◊ — it's because characters are rarely so simplistic as to be easily assigned to a bucket on a 3x3 grid. Further, alignments only make sense for certain series where there is a neat sorting of good vs. evil (or order vs. anarchy). In works where morality is relative, or never discussed at all, even the definitions of the alignments are up for debate, never mind who qualifies. It is for these reasons that, on TV Tropes, we ask that you resist the temptation to assign an alignment to every character you see. Sooner or later someone will disagree with you, and then you'll see the escalating cycle of Natter, Thread Mode, and Flame Wars. Even if nobody disagrees, seeing the Neutral Good label attached to a character is irresistible to some people, and before you know it, characters as diverse as Ariel and Lex Luthor will become the subject of what we uncharitably refer to as alignmentwank. Okay, so what are the rules exactly? Character Alignment is only to be used in works where it is canonical, and only for characters who have alignments In-Universe. There is to be no arguing over canonical alignments, and no Real Life examples, ever. Any examples not meeting these criteria should be deleted.